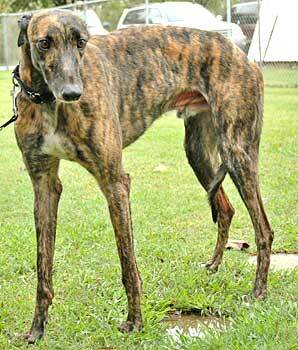 Gap, aka Mind The Gap, is a strikingly handsome 3½-year-old dark brindle male, born April 3, 2001. His sire is the famous Molotov and his dam is Clare Maudie. As you can see, Gap certainly takes after his sire in his looks. Gap started his racing career at Corpus Christi on April 23, 2003 and raced his last event on February 5, 2004. 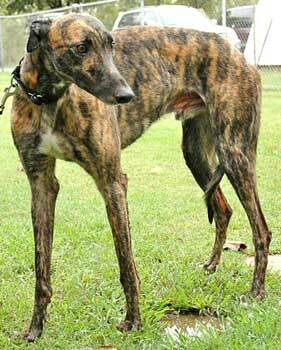 He was a grade AA and stakes winning greyhound during his career. It is not known at this time if Gap is small animal or cat tolerant.